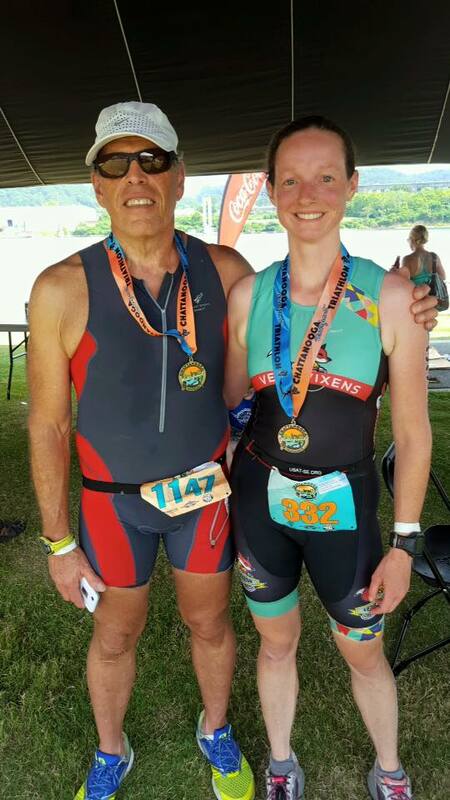 On June 26th, my dad and I did the Chattanooga Waterfront Triathlon, and we both got 5th place in our age groups. This was the first year that a sprint distance was offered alongside the intermediate distance, which was great for Dad since he is still working towards longer swims. I raced the intermediate distance with a total time of 2:47:34. One of my favorite parts of the race is getting to bike on Highway 27. They cone off and close down the inside lane to traffic on each side and have a turnaround at the junction with Highway 153. It was especially awesome to see my friend Charlene Simmons riding her cargo bike on the highway. She was the sweep for the sprint. I told Dad that if he saw a cargo bike behind him, that was his signal that he needed to hurry up. Team Magic always puts on a great, smooth, well-organized race, and this year was no different. It was hot, but there were plenty of aid stations on the course and even a ‘polar zone’ sponsored by the Chattanooga ski team, complete with sponges and hand towels soaked in cold water. The Vixens were well-represented at the race. I enjoyed seeing Ashley King at packet pickup and Beth Lofgren out on the course and talking with Melanie Silva as we waited on Scrappy Field for the swim start. As I neared the run turnaround, I saw Liv Harlow coming towards me, killing it on the run. She got third place in her age group and is headed for USAT Age Group Nationals in August as a result. Virginia Lee was out in the heat giving day before and post-race massages. I was having some trouble with my quad and IT band before the race, but thanks to her I was able to race pain free and recovered quickly after the race. This was my first triathlon of the year and my first triathlon ever in my Velo Vixens trisuit. I’d done a few trail races earlier in the year that I just didn’t feel ready for. I dealt with minor injuries as a result and just wasn’t happy with my times so it was good to finally do a race where I felt like I’d trained properly. I’m looking forward to more to come!